Please take a few minutes to respond to our listener survey. You’ll be entered to win your choice of a $10 Amazon gift card or a signature Devoted Dreamers mug! There is purpose for your life; you are not here by accident. I believe there’s enough in God’s word to back this up, so for this solo episode I’m talking about the two perspectives I’ve been wrestling with related to this topic and how we decipher our God-shaped dreams. The first perspective is that He uses our gifts and talents for our good, for the good of others, and for His Kingdom. The second perspective is that He uses us in spite of our weakness, failure, or even our blatant rejection of His calling upon our lives. So, which is it, strengths or weaknesses? I’ll cover that in this quick 30-minute episode, and I’d love to hear your thoughts in the comments below or over on FB/IG. IF YOU HAVE EVER WONDERED ABOUT YOUR PURPOSE, THIS WAS THE EPISODE FOR YOU. If you’re not sure yet what your God-shaped dream might be, you may find yourself feeling confused about how to determine what that dream is all about. Should your dream flow out of what you’re naturally good at or the skills and life experiences that have made you who you are today? Or might God be calling you to something completely outside of anything you’ve ever considered? Listen in, and let me know what you think. This solo episode is tied directly to my last two solo episodes (#107- You are a Daughter of the King and #110 – You Have Great Value and Worth), in case you want to check those out before you hear this one. I’ve got a homework assignment for you again. I suggest you to take the next 30 days to process through and write out your answers to the questions below if you’re still trying to figure out your God-shaped dream. 1) Make a list of all the things you are good at (strengths) – Have you taken the Strengths Finder? a. Then, make a list of your weaknesses. 4) Ask trusted friends and family members, mentors, advisors, people who’ve worked with you to answer a few short questions about what they see in you – the things you’re naturally good at. We don’t always see some of this stuff. 5) Pray over these things; ask God to reveal what He’s calling you to. If you enjoy just one episode a month, please join my support team with a $5 monthly contribution so that I can continue to provide you with amazing content each week. Click the button above. Praise be to the God and Father of our Lord Jesus Christ, who has blessed us in the heavenly realms with every spiritual blessing in Christ. 4 For he chose us in him before the creation of the world to be holy and blameless in his sight. In love 5 he predestined us for adoption to sonship through Jesus Christ, in accordance with his pleasure and will— 6 to the praise of his glorious grace, which he has freely given us in the One he loves. Now go; I will help you speak and will teach you what to say. 10:47 – God had a plan all along. None of it is an accident. 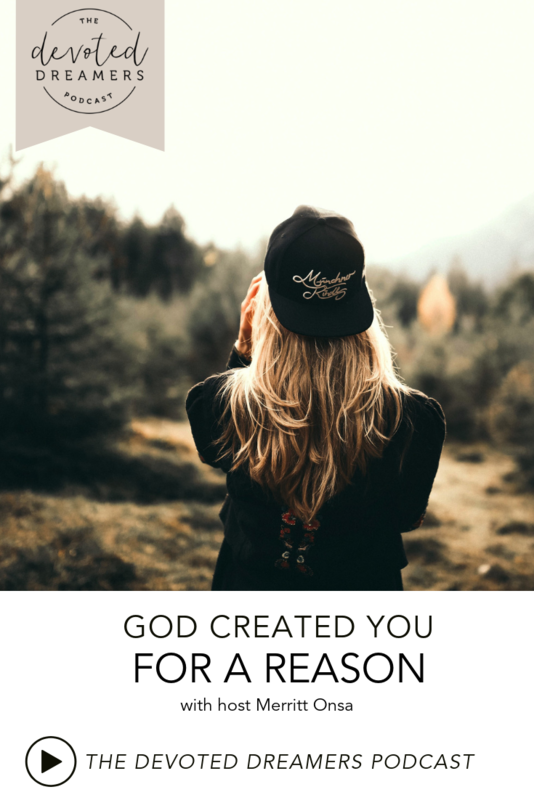 11:15 – He knows what you’re good at, where we fail, our needs, etc. 20:11 – do we look at our gifts or our gaps when considering our dreams?